This past week was Banned Book Week, a time for the library community to celebrate intellectual freedom and the right to read and explore topics. In terms of library traditions, it has the same feel as Black History Month; once a year, there is an extra emphasis placed on those who would seek to move or remove materials from the library and the people who defend against such challenges. Librarians hang “Police Line – Do Not Cross” tape like Christmas garland on displays of books that have been seen, at various periods of time, as immoral, despicable, corrupting, blasphemous, and/or indecent. The stories are retold of the books of the past that were challenged, on what grounds they were objected to, and what books are the current target of challenges. Librarians as a whole take stock as to how to meet these challenges and identify where the points of controversy lay. Overall, it is the essence of a very noble cause to defend the views of others for the sake of freedom of expression. “But that’s not the point,” one might retort. 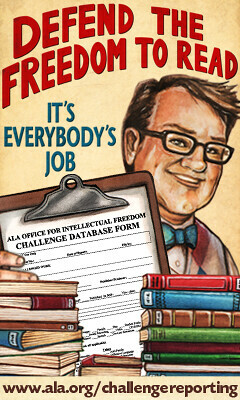 “This is about the principles of intellectual freedom.” Then, my question would be this: why vilify the challengers? Not every challenge is a motion to remove; some are for reconsideration of location. And even for the challenge to remove, it presents an excellent opportunity to educate the meaning of banning and censorship, the First Amendment, and how the mission of the library to provide all with equal access (even for those ideas that we do not agree with). We should not only be grateful for book challenges, we should welcome them. Challenges to library materials should be seen for what they are: a win-win scenario. First, they bring publicity and attention to the library in question. Nothing like a good controversy to bring people into the library to see what all the trouble is about. While they are in the library, we can show them all of the “good and decent” materials we have for those who support the challenge and all the “naughty and awful” stuff we have for those who oppose the challenge. There is no such thing as bad publicity! In fact, I would go a step further and demand that a universal symbol of a book challenge being developed that we can post in the window, hang on the flagpole, or otherwise display in a prominent location. Something that just screams (possibly literally) that “Hey, there is a book challenge here and you should come and see what all the fuss is about!”. It’s the ultimate in book discussion groups; not only can you talk about the context, the themes, and the characters presented, the outcome of the group can potentially change things in the library. And I bet dollars to donuts you can fill up your program room with people who will want to say something on the matter. Second, it brings attention to the material in question. You know what happens to books that are challenged? Their sales and checkouts go through the roof as people, being the curious creatures that they are, want to find out what the big deal is about (or show their support for the book by buying it). I cackle with glee over this simple irony: book challenges push greater awareness for a library title and create a result that is opposite what the book challenger generally intends. I would even lower the bar for how a book can be challenged just to invite more attention to books that would otherwise go unnoticed. Third, as the expression goes, sunshine is the best disinfectant. What we can bring out into the open allows for more transparency in the discussion and the process. This is about respecting viewpoints that are contrary to our own and extending the same courtesy to those who feel strongly enough about a piece of library material to ask that it be re-evaluated. We cannot hope to have someone recognize the right of others to intellectual freedom while engaging in basic name calling by referring to the challengers as bigots, zealots, or otherwise ignorant. While the calmness of the rational mind is not always forthcoming from a book challenge, it is here where we can make our case for materials easily over loud and ill conceived challenges made with little or no objective merit or support. For those with well reasoned grievances, we can provide an equally well reasoned rebuttal where we consider the scope and magnitude of all potential outcomes. Fourth, there is nothing to fear from a challenge. We may not win them all, but on a long enough timeline, the books that have been banned or challenged in the past have endured. Whether they are classics or contemporary, their presence in collections have outlived those who would see them censored. They have never been truly gone, only temporarily removed. Librarians need to look at this on a longer timeline than their tenure. History has proven that it is a matter of time, so like in other aspects of our lives, patience will see us through. For whatever reason, this reminds me of the Edward R. Murrow quotation talking about Senator McCarthy and his hearings on communism. “We must not confuse dissent with disloyalty. We must remember always that accusation is not proof and that conviction depends upon evidence and due process of law. We will not walk in fear, one of another. We will not be driven by fear into an age of unreason, if we dig deep in our history and our doctrine, and remember that we are not descended from fearful men — not from men who feared to write, to speak, to associate and to defend causes that were, for the moment, unpopular. This entry was posted in library science and tagged banned book week, public library. Bookmark the permalink. 1) The fact that a book is still available misses the point. Practically no books are truly “banned” in today’s commercial marketplace. But libraries are places for free access of information, and banning a book there does indeed keep it out of people’s hands–I’m thinking here primarily of books for gay teens. 2) Yes, banning fusses often give a book publicity and sales, but “through the roof” is overstating it. Of the books on the banned books banner you show, some are “hits” with huge sales (Carrie, Light in the Attic, American Psycho) and some are time-tested classics, but many, maybe even most of them, have never hit a best seller chart. I’m a little surprised you didn’t bring up the issue of library self-censorship, in the form of selection (and necesary passing over) of books, but I guess that’s a whole other blog post. (1) I guess market alternatives are not the happiest solution that people would embrace past the public library. I see it as a ‘next best thing’ solution as the material is not simply limited. Yes, this does restrict access for gay teens, but I would hope that a gay advocacy group could step in and cover the difference. It is not from a lack of trying that book is not kept within easy access. (2) Perhaps “through the roof” is a bit of an overstatement. But they certainly sold more than they would have without the controversy. It is pretty relative as well; if the book had sold 10 copies, then had a challenge, and sold 10 more copies, that would be an increase of 100%. If it sells more than it would have ordinarily, then it’s a win in my book. I’m not concerned about library self-censorship as a whole. As an organization with a finite amount of resources, decisions must be made as to what to include or exclude. Under these parameters, I don’t think any librarian would escape criticism as to their choices of materials to add to the collection. 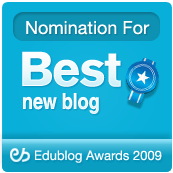 Finally checked out your blog and so interesting that you would have posted about this — just wrote about it in an MLIS paper. The Annoyed Librarian had a post up about this lately as well. I happen to agree with you — I think ALA et al are making a big self-serving fuss about something that is essentially not a big deal. No one would say that a book that happens to be not available in one particular library is “banned” — even within our libraries, no one expects any one library location to have EVERYTHING. That’s why we have ILL. And “collection development policies” will exclude things more often than customer complaints. I actually think patrons should be allowed to challenge books — isn’t that part of the free speech we’re supposed to be all fired up about? Especially because in 6 out of 7 cases, those challenges DID NOT result in books being removed. I would not say that it isn’t a big deal; any restriction on library material is a big deal. For the staff, it creates something they have to treat differently (e.g. shelve in a different location from other books of its type). I think it is more of a matter of someone else putting restrictions upon us. As in, we are limited enough by budgets, we really don’t need additional restrictions on what we can and cannot collect. I welcome book challenges because I think that open debate illuminates underlying rationales. It separates the subjective rationales from the objective ones. This is not to say that all subjective rationales are invalid, but just because a book offends a particular personal sensibility does not give reason to move or remove it.